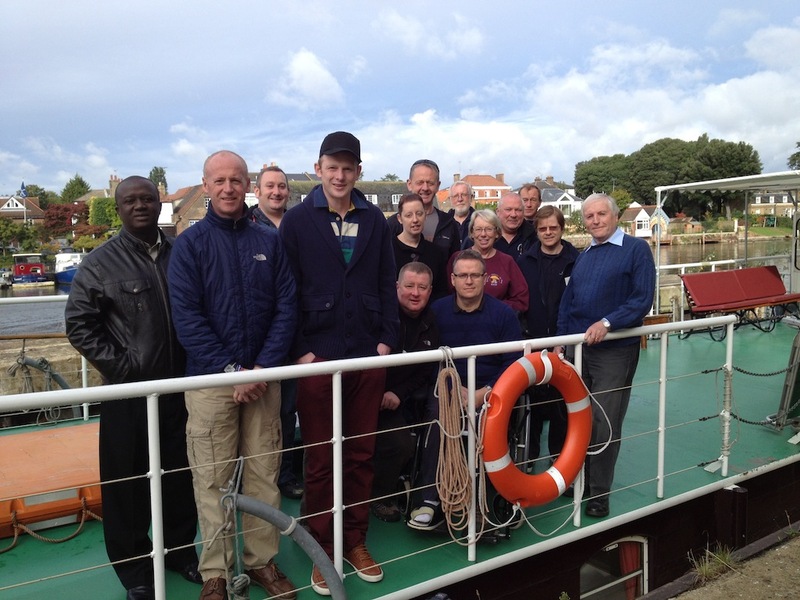 Patients and staff from the military rehabilitation centre at Headley Court aboard the Richmond Venturer. IT won’t surprise any of my regular readers to know that I find a trip out on the Thames a very therapeutic way to forget the stresses and strains of this busy life. Just slipping along through the water with the sun reflecting in a thousand shards of light from the river’s surface is guaranteed to lower my blood pressure and help me relax. And clearly, I’m not alone with that thought. A party of disabled service personnel and support staff from Headley Court, the military rehabilitation centre in Epsom, boarded the Richmond Venturer on Friday for a cruise up the Thames from Kingston to Shepperton. Venturer, a specially converted barge with disabled access, is operated by the River Thames Boat Project, a registered charity that aims to give people the chance to access the Thames, to discover this fascinating river and learn about its environment. Miranda Jaggers, executive director of the River Thames Boat Project, said: “I am delighted to welcome a group from Headley Court for the first time. We do an increasing amount of work with the veteran’s mental health charity, Combat Stress and know that disabled service men and women suffering from post-traumatic stress disorder find that a day spent on board the Venturer is very therapeutic. The cruises that the River Thames Boat Project provides are heavily subsidised through grants and donations, but none of the 17 cruises for service personnel with physical disabilities or mental health problems it has run this year received specific funding. If you would like to support their innovative Thames Therapy cruises please visit www.thamesboatproject.org/donate. Although it was a first for a group from Headley Court, they were just one of the 130 community organisations and school groups the River Thames Boat Project has worked with this season aboard its fully accessible community boat. I hope we see many more ex-servicemen on the river in the future. DON’T forget this evening sees the meeting of River Users’ Group number eight at the Thames Motor Yacht Club at Hampton Court. I wrote about this a couple of weeks back and it is your chance to have a say in the future of the Thames. The meeting starts at 8pm.